but where was the man himself? On May 3rd, the Saturday of the recent bank holiday, the conductor David Johnson led the Choral Society, the Cantilena Orchestra and three eminent solo singers in a performance of the Creation by Josef Haydn. An article in another newspaper announcing the event stated confidently that the performance would feature Josef Haydn himself. Regrettably this proved to be a little over-optimistic, since the Choral Society does not have the resources to make such a star appearance materialise. Haydn was sadly indisposed anyway, it transpired, having died in 1809, one hundred and ninety nine years ago, and thus one felt bound to excuse his absence. Stories that a coach and four had been seen proceeding to Macclesfield station to collect the great man from the Virgin Pendolino from Euston turned out to be slightly misplaced, since it was simply Gawsworth’s driving team out on a regular exercise in the vicinity. None of this, however, took anything away from a splendid evening’s music. As often happens when a number of critical artistes are booked, glitches may occur, and such happened this evening, over and above the unfortunate forced absence of Haydn himself. In this case tonsillitis among the soprano population of the North West caused not just a late substitution, but an even later substitution of the substitution. Thanks to the effective networking among the staff of the Royal Northern College of Music, Janet Fischer was able to stride confidently into the role of soprano soloist and deliver a masterful performance at short notice. This indicates the sheer professionalism of the graduates of that institution. Janet had not in fact sung the role before, and had received only 3 hrs tutorial in the work. She was magnificent. With skill and ability like that, it appears that miracles can happen. This is to take nothing away from the other two soloists, Mark Rowlinson, and Christopher Turner. Together they made a well-matched trio singing lyrically, magisterially, dramatically, amusingly, as the words demanded. Haydn’s Creation is an oratorio – an appellation that makes you think perhaps of something highbrow, religious, grand, long, and perhaps, even, boring. This would give a quite false impression of this work, and Haydn’s other oratorio, the Seasons. True, the Creation deals with the first six days of the story of Genesis, but just as a six-frame skeleton. The flesh is a beautiful and thrilling depiction of the wonders of it all. The creation of light is hugely dramatic, the creation of stars, the sunrise, and the moon is wonderfully beautiful and lyrical, the depiction of storms, thunder and lightning rather exciting, the representation of the spring morning, with streams, flowers, trees etc is ecstatic, and the creation of the creatures of the world is graphic, charming and rather like a carnival of the animals. All of this was achieved with the very well-rehearsed choir, the great instrumentalists, and the excellent soloists. Who can forget the grunts of the contrabassoon, the deep-sea sounds of the double bass and cellos to depict the whales, the prancing strings to describe the movements of the stags, and the other inventive orchestration to represent the lion, the tiger, the insects, the lark, the nightingale, the cattle and the sheep? This representational music is just part of the amusing aspect of the piece, one facet of the description of nature, where the lasting impression is of the composer’s wonderment at the beauty of unspoiled nature, a wonderment which is conveyed unerringly to all present. Truly, Haydn has us at his fingertips in this music. He has that knack of conveying his own feelings directly to the audience – we all laugh at the deliberately funny episode with the lowly worm, and we all fill with joy as he conveys the beauty and joy of the spring day, and we all fill with appreciation of the wonders of nature as a whole, and of the pristine earth, before Man messed it about. You emerge with perhaps a strong sense that Haydn wants us to see this as God’s creation, but with, I believe, an even stronger sense that the composer was celebrating the natural wonders of the world above all, so that it leaves you with the impression that it is not just a religious work, it may not be primarily a religious work, in spite of its explicit context of Genesis, but it is a celebration of nature and of life itself. All this of course depended on the success of the performance as a performance, live, with living musicians rising to meet the demands of the conductor David Johnson, who has ultimate control over the dynamics, pacing, and thus whether it comes across eventually as just a virtuoso performance of a big work, or whether it does more than that, acquiring a soul of its own, a thing of beauty to move the soul, and not just an accurate succession of the notes as printed n the score. In this, he succeeded brilliantly. Audience members said it was one of the best performances ever by the choral society, that it enabled them to overcome their misgivings about the oratorio format, and that Haydn’s sense of wonderment was conveyed convincingly. So, to conclude, in the corporeal sense, Josef Haydn was sadly unable to be present, in spite of the confident billing. This was the Creation, not the Recreation, nor yet the Resurrection, a title used by Gustav Mahler for his second symphony, and a title which Haydn, as a Christian, would not wish us to use in the wrong context. However, music is indeed about recreating the vision of a composer using his score as a blueprint, but not just playing it, but conveying the composer’s will, recreating the work of art as he conceived it. 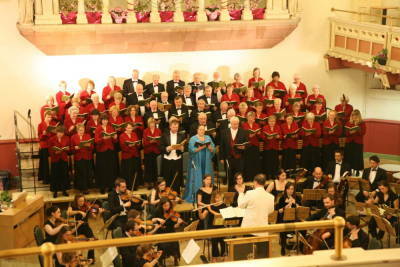 In so far as we all emerged thrilled by what we had heard, and buoyed up by his joie de vivre, as recreated in this performance by Congleton Choral Society under David Johnson, Josef Haydn was indeed present in spirit in Congleton Town Hall on that Saturday evening in May.